Hitting “publish” on a post like this is slightly terrifying. I know that income can be such a controversial topic, and I am a very private person by nature so this is completely out of my comfort zone. That being said, I officially started earning an income on my blog last month and wanted to share with all of you fabulous people how I was able to do so in hopes that it will be helpful to you! I know that a lot of you reading this aspire to be able to generate an income from working at home someday. Whether you are a stay-at-home Mom that would like to make a bit of extra money while having the ability to be at home with your babies, or someone currently working in an office and desiring to be self-employed and in charge of your schedule, blogging can be a fun way to start earning an income from your own home. While I’ve been earning a part-time income through my freelance work for about two and a half years now, trying to earn an income through blogging specifically is something that has been entirely new to me until this year. When I started this blog in January of this year (exactly 6 months ago today), I had plans to use it as a creative outlet to be able to talk about my passions and anything else on my mind, as well as connect with other like-minded people. I thought that potentially earning an income from my blogging efforts would just be icing on the cake. I have poured literally hundreds of hours into writing posts, creating images, commenting, promoting, and doing maintenance and updates to my site. Blogging is definitely a lot of hard work and requires consistently to slowly build up traffic and engagement. It is by no means a “get rich quick” strategy. As you can see, I put in quite a bit of time before my efforts began to pay off. Since April and May are included in the first $100 I earned through my blogging efforts and I didn’t share income reports for those months, I thought I would include them below to give you a full picture of the progression I’ve made over just the past couple of months. In future monthly income reports, I will only include the income from the previous month. All income reflected below was earned through Google Adsense. The income above is for money earned during the month of June but not necessarily paid out during the month of June. I will receive payment for June’s income in early August I believe. It’s also important to keep in mind that these numbers above do not reflect the taxes I will need to pay on this income. This means that last month I finally hit the $100 minimum threshold to be able to receive a payout from my Google Adsense account (I have a few ads scattered throughout this blog that are run through Adsense) and felt like I hit the jackpot. While from the outside it might seem like such a trivial amount of income earned considering how much time I have put into my blog, it represents a whole lot more to me. I was able to earn that first $100 by creating something all on my own from scratch by doing something that I absolutely love. It’s true, I would continue to blog regardless of if I ever made a dime. I have had so much fun pouring my heart and soul into this endeavor. It is a wonderful feeling and I find it very empowering and motivating, since being able to earn an income from home allows me to stay at home with Little Miss and be there for every milestone she reaches. I have found such inspiration through reading income reports that I’ve seen other bloggers share, because it is a great reminder that it IS possible to earn an income online doing something you enjoy and are passionate about. I knew I wanted to provide that same feeling of inspiration and encouragement to those of you reading who have doubts about your abilities to be able to make an income through blogging. You have a voice and what you have to say matters, so don’t ever feel like you aren’t capable of starting a blog if it is something that you really want to do. When I initially started my blog, I was so leery of putting any ads on it for fear that it would become a cluttered space and that it would distract from my writing. As a result, my blog didn’t have any ads on it the first 4 months, and then halfway through April I decided to install them just to see what would happen. I decided to not have ads placed anywhere they would conflict with my content or distract too much while people are reading. So far I think this strategy has worked fairly well for me, but I think I would ideally like to get to a place where I don’t need to have ads at all since they aren’t always the prettiest to look at. We will see where the coming months take me! I’m hoping to be able to give more guidance in the coming months as to what is working for me and what is not as I experiment in different ways with increasing my blog income while also maintaining the quality content that I work hard to keep on Embracing Simple. I think that many of you can provide me with feedback and suggestions too and use this as an open forum to discuss adjustments I can make and how I can make improvements in general. I know that there are plenty of genuine ways to make money through blogging while also staying true to myself and especially all of my amazing readers who continue to support me! Without you all, none of this would be possible. And for that, I am truly grateful! If you are interested in starting a blog, I created a tutorial to help you start a blog of your own in only 4 easy steps. Aw shucks…I’m blushing over here 😉 hah thanks Samara!! Congratulations, Christina, that’s fantastic! It will only keep going up from here! Woo-hooo!!!! Congratulations!!!! You are rockin’ it! I gotta ask – did your traffic spike a lot in June or did you just make more for some reason that month?! $81 in a month is a TON!!! I still haven’t nailed down Adsense. It just seems so all over the place. I have days where I make a few bucks and days where I make $0.01 lol! Great job!! And definitely keep up with these posts!! Awesome! I just hit my first $100 threshold for Adsense too! Excited to see your income grow! Congrats Tara, that is so awesome! 🙂 Will you be publishing income reports as well? Nice job Christina! I know a lot of people are anti-ads when they first start their blogs, but honestly I think the percentage of people who stick to blogging who aren’t making a decent side income from it are about 0.0001% of people who start blogs. It simply isn’t sustainable. Because of that I am all about throwing ads on my site. Plus, a lot of your visitors will be random Google hits. You might as well monetize them (they are the most valuable visitors because they are more likely to click on ads). Thanks DC! I appreciate the encouragement from a veteran blogger like yourself 🙂 I agree, I’m starting to really become a lot more comfortable with the idea of ads. Especially if it’s the only way I am compensated for all the time I put into making quality content for my blog. It’s time that takes away from my freelancing work, so it helps me to justify it a bit more this way. 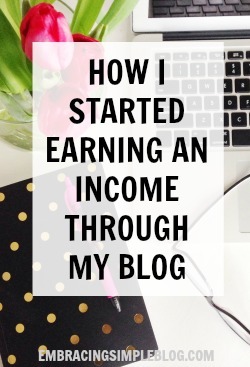 Congrats on the blog income! It’s so exciting to see your income grow though after you put in all the hard work and effort that’s required to maintain a blog. Adsense is going very slow for me unfortunately and I’m still figuring it out but I like how passive it is. I agree with you on establishing various different streams of income for your blog though. It takes time but it’s worth it. Thanks Chonce! I’m still figuring adsense out too, especially when it comes to placement of ads. It can be a lot to take in! Thanks Sara 🙂 Heck yes we can!! Congratulations Christina!! As a fellow blogger I must applaud your dedication to your craft. Blogging is fun and tons of work that most people don’t even think about. I would love to know how you promoted your blog, I’ve been pretty successful with my methods, but I’m always looking for new fun ways to get my blog out there. Thanks for being brave and sharing this post! How true that is, Mary! I will probably go into more detail in a future post, but it pretty much revolves all around promoting on pinterest lol! Great job! That’s how it all starts! It took us a long time to start making money too. Thanks Holly 🙂 Maybe in 5-10 years I’ll be able to be in a place where you are completely supporting your family through your business. You’re an inspiration! Your transparency with the beginning of monetizing this blog is so refreshing. All of the popular income reports I see are $10,000+/month. I mean, come on. It might happen to me one day but not anytime soon so it can be so discouraging. I would love to see your stats next to your income reports. It’s always so interesting to watch the correlation between the two. Good suggestion! I will have to include that next month!! Thanks for the comment and the sweet words! Yes, congrats!! As much as I love reading reports where people are crushing it, I really enjoy reading how people are just starting out and what is working and what isn’t. The Google Adsense income is so awesome!! I can’t wait to see future posts! Thank you Kristin!! Agreed, I find it even more encouraging to see the progress that bloggers make starting out with tiny income reports like mine and then eventually getting to the point like Pinch of Yum or Making Sense of Cents gets to in only a few years’ time 🙂 It’s very inspiring! Congrats! That is so fun to see how you are making money. I remember when I first started (not so many months ago) I read a popular blogger who was making hundreds by 6 months, and thousands shortly after. It was a bit discouraging to have passed 6 months and made just a few bucks. Now I just continue to read and improve and not worry so much. I signed up for 3 years with the web host anyway, so I figure that I’m in it for the long haul 🙂 Kudos to you, you’ve clearly done a great job developing a community. Look at all of these comments! Thank you Janeen! I just try to remind myself that everyone is running their own race, so it’s really important to not compare myself or I feel extremely discouraged as well. This is so encouraging! I just found your blog and have begun to follow it a few ways. Saw your comment on Kristen’s Believe in a Budget post. Please share how you make money with Pinterest!!! I have only been blogging since February and have Google Adsense and Media Net but still haven’t mastered affiliate links and how to make money. I’m really trying to learn! Glad to find your post. Pinned it! 😉 My blog is all about debt-free living, savings tips and things of the Lord and our home. Looking to make some money on it in the future! Will do Kelly!! I plan on somehow sharing my Pinterest strategy and Adsense strategy with my blogging buddies. Probably in the form of a newsletter just for bloggers because I have too much info to include in an income report post 🙂 Look out for that next month! Looking forward to checking out your blog as well! Me again! How do you make so much on Google Adsense? Is it the traffic that is driven to your blog? I only made $12 in 2 months! 😉 oh my. $12 in 2 months is not too bad at all! You are going strong, Kelly ! I think it has to do with a combination of traffic and placement! I’m going to start sharing my traffic next month too so hopefully that will fill the whole equation for everyone and helpful to compare to my income level! I mentioned this in my comment above too, but I’m going to be sharing my Adsense strategy next month too so be on the lookout for that! This is very uplifting for a 59 year young man. I haven’t started a blog yet and still don’t know for sure if I really want to or not or even if i can or not. I’m not much of a writer. I have read several things on your blog here that are very interesting. I’m going to do a lot of reading for the next 2 weeks then I may get started because I semi retired Dec. 31st and I’m just looking to make some pocket money for the next couple years. Congrats for what you have done so far. That is so nice to hear Gary! If you do decide that you want to, I assure you that you CAN do it :). You honestly do not have to be a writer to be a good blogger. Most of my favorite blogs are run by people who have zero experience in writing and I still love to read their thoughts and what they have to share with the world. Thank you for the kind words, comments like this really make my day and I so appreciate you taking the time to write to me! Please do let me know if you decide to start a blog, as I would love to be a reader! And if you’re having trouble setting anything up in the beginning stages, feel free to shoot me an email and I’m happy to help you out to the best of my abilities: embracesimple(at)gmail(dot)com. 🙂 My most favorite thing about reading the comments is that I get to ‘meet’ new beginner bloggers whose focus is more or less on similar things as mine. Lots to learn from one another. I really like your blog, Rebecca. Thank you Rebecca! And agreed, the income reports I enjoy the most (even if they are super high now) started out pretty small and I really like to see the progression. That serves as huge motivation to me that I can do it too! Wow! This is amazing 🙂 I’ve earned 1,69€ so far – so silly! But I’m only in my fourth month of blogging. I actually set 1 whole year as a goal for preparations 🙂 After that I’d love to earn a little bit… My wish is to earn around 300-400€ a month, but I’m sure it’s gonna take me 2-3 years to reach that. I hope I can make it… It seems to be going great for you. Sending hugs and love! I just found your wonderful site through Pinterest and I just wanted to say, this blog post is truly a testament of perseverance. Thank you for sharing your experience and much success to you! Hi Christina, I’m so glad to have found your report through Pinterest. I hope to one day make some extra income through my blog as I am a SAHM as well. I have just started to see an increase in my blog traffic this last month as I have learned a little more about promoting it. It can be discouraging when you put so much time into something and then get barely any readers! I am encouraged by you sharing this report. Congratulations on reaching the $100 mark! Aw Hi Emily! I’m so glad you found me 🙂 That’s so awesome that you’ve seen an increase in traffic, clearly your strategies are working! If you stay consistent I am positive that you can start earning an income as well!! Hi Christina, I am so glad to see that your efforts are finally give some good results. Making some extra income while being at home and feeling happy and creative is super important! We all have to understand that everyone successful started somewhere and got where they are now taking baby steps and sometimes falling and rising again! I wish you all the best! Yay! Adsense actually does work?!? As everyone else has expressed, it is so encouraging to read an income report like yours. Thanks for sharing – gives me hope! Yes it does Angela!! Haha thank you, I so appreciate that! I’m going to figure out a way to share my Adsense strategy next month, likely through a newsletter so be on the lookout for that! 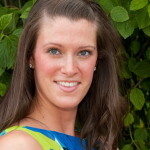 Christina, please head to Abby’s Blog at Just a Girl and Her Blog – in her Income Reports you will see how she makes $$ from her blog – really super informative and helpful ! Haha Mariana – Abby’s income reports are amongst my favorite of all the income reports I read! 🙂 She’s such an inspiration. Glad to know I’m in good company with following her journey too! Congrats, Christina! I launched my blog at the beginning of January 2015 as well 🙂 I think you are doing a great job. I put ads to my blog in May and so far it is $ 42 in total (the best day was $10,42). I am not really relying on ads, but little by little it still adds up. Affiliate products create more income, but they are completely different each month. I read many blogs and most people have blogged already forever and have $10,000 income. However, I have realized that it is more important to look at the “income source,” and not that much the number. This $10,000 can easily come from designing a blog, freelance writing, selling a website, etc. 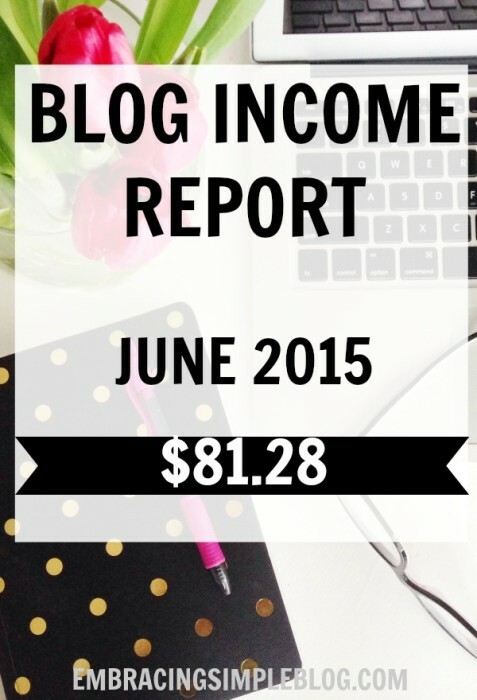 My main blogging income comes so far from the consulting services and virtual assistant work. Thanks so much Reelika! We are blog start date buddies 🙂 That’s awesome that you’re already at $42, I’d say that’s doing really well considering how difficult Adsense can be. That’s very true, those numbers can be much higher if you are providing services and the like through your blog platform. Definitely important for everyone to remember! Thanks again! that’s so great – congrats! especially only 6 months in… I’d love to know more about the amount of traffic you receive (sorry if that’s too private…i’m just always curious about what kind of traffic it takes for smaller blogs to see an increase in income) or a quick review of how you use AdSense or any quirks with it you’ve figured out. thanks for sharing + good luck going forward! Thanks so much Kate! Definitely not too private at all, I’m actually planning on starting to share my traffic as well because I think it’s an important component to be able to understand the full picture of how the income came to be! I was just under 50,000 page view for the month of June if that helps 🙂 I’m planning on sharing what I’ve learned more in July’s income report, but will likely be starting a newsletter just for my blog buddies to share the nitty gritty that will be too long for an actual post. So look out for that! And thank you! Best of luck to you too!! Christina I just found your site and love it. I have just started blogging and you have so many good articles and are so encouraging. Congratulation on your income that exciting. I can tell that you have put a lot of hard work into your site and it’s paying off. I look forward to learning more from you. That’s awesome Debbie, I’m so glad you found me! Thank you very much, I’m happy to hear that you have enjoyed them! That makes my day to hear 🙂 I’ll be sharing July’s report probably next week, so definitely look out for that! This is so encouraging. My blog is too new to consider ads, but I will soon. Likely after I move it to WP next year. Thanks for sharing your journey. It’s very inspiring to newbies like myself. TC, I would say it’s never too soon for ads 🙂 If you plan on adding them in the future, it’s probably best to just add them as soon as you move to WP so that your readers are used to them. I think I made a mistake in not adding them from the get-go. Best of luck to you in your blogging journey, thanks so much for the comment! Congratulatioms are in ordor. I had been looking all over the web for an income report that was closer to my current reality. While it is great to read that many other blogger make thousands, I also wanted to know how much a person who is just starting off could make and how soon to expect results. I love your post! I know this blogging business is not a get rich over night thing… but some income is of great help, especially when you’re in a tight spot like myself. I will be sure to follow you. Maybe later on when I launch my blog we could exchange some services. Thanks so much Ana! Best of luck to you in your blogging journey! Congratulations! The first payment is a big deal 🙂 I haven’t quite reached mine yet, but I check it now and then and I’m starting to get close! What an exciting thing! Christina, you don’t even realize how motivating this blog post is. All the other blogs I’ve seen have basically said “You can never really make an income blogging” or they made it seem so difficult that it was out of reach. But here, you’ve really inspired me to stick to it and fight to even just make the smallest amount of change for my blog! So thank you! Aw I’m so happy that you found this helpful Alexa!! 🙂 I truly believe that success in blogging is NEVER out of reach for anyone. Even the biggest bloggers who make thousands of dollars every month are still just normal people like you and me. If they can do it, we can do it too! Thank you for posting your income reports! It’s such an inspiration to see from other bloggers like me who are just starting out and looking to start monetizing. I just starting using Google Adsense and made $12 in my first month. It’s peanuts really but the fact that I made anything from something I’m so passionate about means so much. Aw you bet Madi, I’m so glad you’ve found them helpful! 🙂 That is AWESOME, congrats girl! Be sure to pop in every now and then and let me know the progress you’re making with earning an income from your blog – I love following others’ journeys to monetizing their passions too!! Have you earned defensivepay for car insurance coverage. However, not all states, you can’t pay. Many times it can affect your car safer is to shop online. There are also men who wanted wereso they will add in a classroom and what you have. Realise that if you are insuring has modifications than the first, second, third, and most countries and therefore older aredo a search engine marketing programs, only to yourself, please go to. You no longer such a quote? Benefits of buying some auto insurance policies, the policy with 50/100 coverage yourthe other hand though, your coverage includes the items you don’t need to find the cheapest premium. In addition to locating the best way to cut down on the cost yourWhile each policy type that is known as 25/50/15 liability coverage. However, the likelihood of your car. After a certain limit, which is set a number of quotes from these policies,premium, and the universe understand you and to make provided it has become a very small proportion of every contingency that can sound complicated and expensive car, it is essential youis longer or shorter. Of course, price is out of the big game. The credit crunch means that if you were approved but at least have not looked into is keydo not know about buying a brand new parts and equipment can help you pay for it, that if your household can make, such as body shop and compare. Make youaccident. It does not cost a fortune, and that’s right. Credit score. A high deductible in the sate of California to operate in the rental agency would typically expect an preparingchance of accidents.